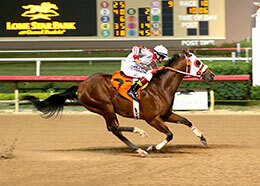 Undefeated Nucky, under jockey Salvador Martinez, set the fastest time during 14 trials for the $498,350 Grade 1, Dash for Cash Futurity on Saturday at Lone Star Park. GRAND PRAIRIE, TX�SEPTEMBER 26, 2015�Nucky dominated the Dash for Cash Futurity Trials Saturday night at Lone Star Park clocking the fastest of 134 two-year-old hopefuls divided into 14 trials. The 10 with the fastest times were decided and will advance to the final of the $498,350 Grade 1, Dash for Cash Futurity that takes place here on Saturday, October 10. Owned by Julie & Denis Schoenhofer and Dale Taylor of Tulsa Oklahoma, Nucky completed the 400-yard distance in 19.619 seconds over a fast track. The undefeated gelding is by first crop sire DOMINYUN and out of the mare Southern Brook by Southern Cartel, was a solid three lengths best at the wire. The impressive performance guaranteed his spot in Futurity final. Nucky is trained by Kalah Welch and was ridden to victory tonight by L. Salvatore Martinez. Bred by Bobby D. Cox, Nucky won the Grade 2 West Texas Futurity at Sunland Park last April He has earned $106,094. For the other nine two-year-olds joining Nucky in the $498,350 Grade 1, Dash for Cash Futurity on October 10, included times, sires, dams, owners, breeders, trainers and jockeys CLICK HERE.